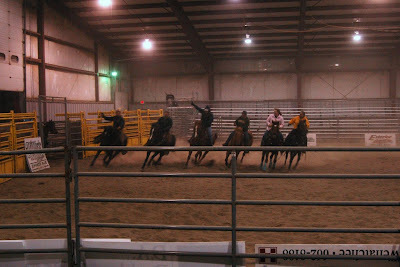 Last night we went to watch my friend Kelly (of the Fearsome Foursome fame) practice her horse routine. She's part of an equestrian drill team and they're performing at a local rodeo this weekend. She invited us to come watch them practice since it would be less overwhelming for Cory. By the time we got there they had already been practicing a bit and it was so dusty you couldn't see clearly. I almost thought it was my glasses all fogged up from the cold, but when I looked over them it was exactly the same. So please excuse the quality of these pictures as it was so dim I had to turn my ISO all the way up to 1600 to even hope to get non-blurry pictures! It was really fun to watch them though, their routine is set to music and they do a good job. 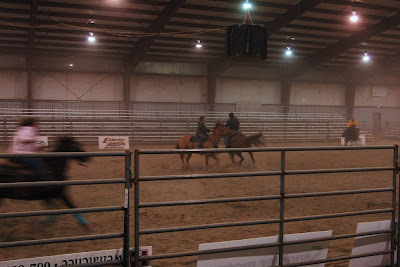 You have to have a lot of control over your horse to do a routine like they do. After they were done practicing Kelly came over to the fence and asked if Cory wanted to ride. He said yes so he got to walk around the arena once while "auntie Kelly" cooled off her horse. He thought that was pretty cool and didn't want to get off! All the way home he kept asking to "ride horse? ride horse?" Equestrian drill team? How awesome is that?! Awww...cool! He looks so thrilled! Drill teams are becoming more and more popular. I've ridden on a quadrille team (team of four horses) and done pas de deux, which is basically a "dance" on horseback with two horses and riders. The riders mirror each others' movements to music. 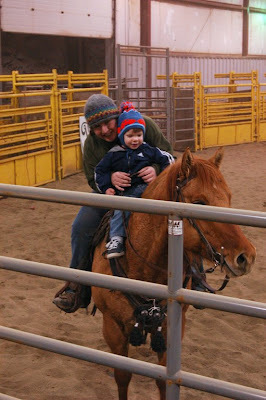 I used to ride horses as a kid I loved it and Im sure the kid will. That's awesome that he enjoyed the ride!